Here is some exciting news for you about Universal Orlando Resort! 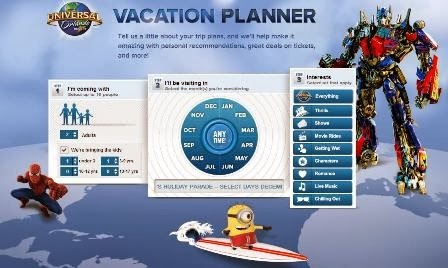 Universal Orlando Resort is launching a new online vacation planner to help you plan a Universal Orlando vacation in a fun and interactive way, all from the comfort of your home. The vacation planner allows you to completely customize your vacation and have access to experiential videos, personal recommendations, travel tips, sample itineraries, vacation packages and more. Just click the “Plan Your Visit” tab on the Universal Orlando website. The “Watch” option hosts a series of specially created videos featuring Emily Kaufman, The Travel Mom and leading expert in family travel, and showcases why Universal Orlando is the perfect vacation destination. The “Customize” option is where your can create and book your personalized Universal Orlando adventures. The "Browse" section includes sample adventures which allow your to browse recommendations based on the type of vacation you are looking for, from Family Fun to Grown-Up Getaways to Thrill Seekers. Vacation like you mean it at Universal Orlando Resort – where every heart pounding, jaw-dropping, goose-bumping second counts. With two incredible theme parks, Universal Studios Florida and Universal’s Islands of Adventure, three magnificently themed on-site hotels and a nighttime entertainment complex, Universal Orlando is the only place where you can turn spending time with your family into spending time as a family. Together, you can soar above Hogwarts with Harry Potter, swing above the streets with Spider-Man, become a minion in the hilarious and heartwarming Despicable Me Minion Mayhem ride, and join Optimus Prime in the fight to save mankind on the new mega-attraction, TRANSFORMERS: The Ride – 3D. Universal Orlando Resort is part of NBCUniversal, a Comcast company. Follow Universal Orlando Resort on Facebook, Twitter, Instagram and YouTube.